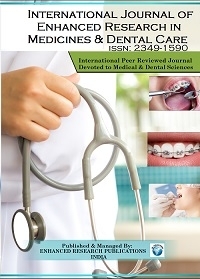 Papers are being invited from the authors/researchers for publication in IJERMDC, ISSN: 2349-1590, Vol. 5, Issue 12, December-2018. Manuscripts are being uploaded soon after the Reviewer's decision and submission of copyright form & Processing charges by the Authors. Many of the manuscripts are under review. IJERMDC is indexed in Thomson Reuters Researcherid, Orcid, Google Scholar, Research gate and many more indexing libraries.